On the fifth afternoon of our civil rights adventure we enter Selma, Alabama. We’d spent the morning in Montgomery celebrating Martin Luther King, Jr. Our first Selma stop is the National Voting Rights Museum. I had no idea there was such a place! Pictures and memorabilia in the process of becoming exhibits cover the floor of the new museum. Our guide, Sam Walker, who was eleven when the Selma marches began, recounts the events that lead to five deaths in a couple weeks pointing to pictures to illustrate each point. “The police who lined the route did not deter the marchers. 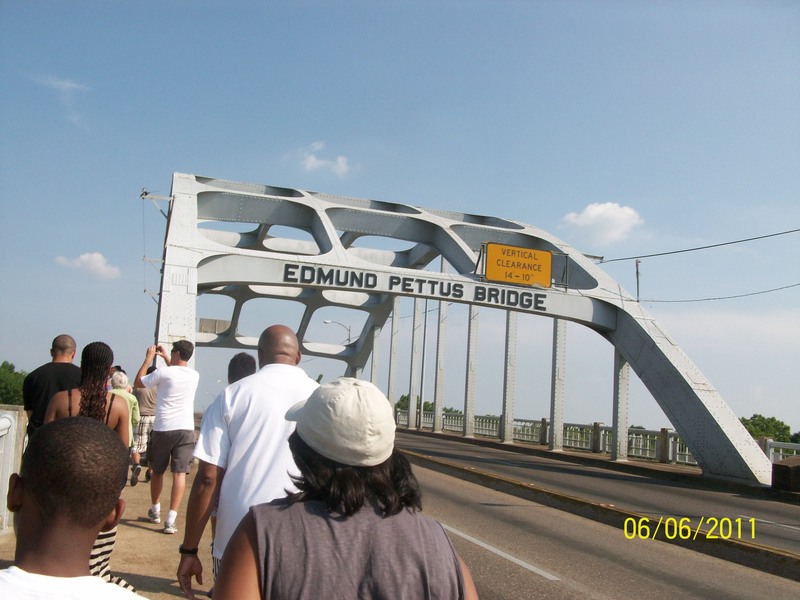 As they marched across Edmund Pettus Bridge that linked Selma to Montgomery, the scene changed dramatically. A swarm of Alabama state troopers appeared dressed in riot gear. Some were mounted on horses. Major John Cloud issued the demonstrators a two-minute warning to turn around and go back to the church. He waited, then gave the order for the state troopers to advance. Demonstrators panicked as the troopers attacked. Many were overcome by tear gas, others beaten with clubs. Marchers fled for fear of being trampled by horses. Men, women and children were slugged. Sixteen marchers ended up in the hospital, another fifty received emergency treatment. Reporters covering the march caught the brutality on camera.” Thomas, Velma Maia, We Shall Not be Moved: The Passage from the Great Migration to the Million Man March. (New Your: Crown Publishers, Inc., 2002) 20-21. “The second march began on March 9, this time led by Martin Luther King, Jr. Although President Johnson had warned King not to march until he could issue a court order to protect the marchers, King called on religious leaders across the country to help in his cause. That afternoon, he led a crowd of over 2,000 people from the town of Selma. Rather than continue on to Montgomery, however, King stopped the march at the Edmund Pettus Bridge, the site of the previous attack, and asked his followers to kneel and pray. “Even though the second march never reached Montgomery, King’s act of restraint did gain him support from President Johnson, who urged Americans to stand up against the acts of brutality committed against the people of Selma and promised to introduce a voting rights bill to Congress. With the words ‘We shall overcome,’ Johnson expressed his desire to eliminate the plagues of bigotry and injustice. This is the place for my book! I leave one with Mr. Walker and intend to do whatever I need to do to have the book sold from their gift shop. I’d heard Martin Luther King’s call to religious leaders to come to Selma in 1965. It wasn’t only religious leaders who went. My U.S. history teacher’s assistant apologized that there would not be class next week because he was going to Selma. I wanted to go – after all, I knew him, and he went. But my loyalty to my folks because of their sacrifice to send me to the University of California, and looming final exams kept me in California. However, within a month Martin Luther King called for voter rights worker volunteers to canvass the South beginning in June. June! After finals! Just for ten weeks! Back by the fall! How could I pass up such an opportunity? I signed up. That was then. Today I can see the rewards of my labors and those of thousands of others. A National Voting Rights Museum! Next stop is the Slavery and Civil Rights Museum. Before we leave the bus we are told repeatedly that we can leave the “museum” at any time. We are told it is an interactive experience. Sam Walker is our guide, but he is not who he’d been at the Voting Rights Museum. He is very successful in making the transition to ghastly slave captor and slave seller. Lined up along the outside wall of the museum – bucks to one side of the door, wenches on the other – in the sunshine, we wait. We wait: hands open and stretched out in front of us so he can see them top and bottom, mouths open so he could check our teeth. When we walk we have to walk with our knees bent. We are forbidden to speak and if we look him in the face, we can expect to die. The simulation continues through captivity in small cells in fortresses on the African coast. No bathroom facilities. The new slaves might be in these cells for a couple of weeks to four months. Next we close our eyes for the experience in the ship, because it was always dark inside. The rules like having our knees bent continued. Slaves were loaded onto the ships according to height; women and men were mixed. No bathroom facilities. Each day (I wonder if it was each day.) slaves were brought up on the deck and the hold washed out – as were they. Dead slaves were thrown overboard. Some live slaves chose to jump rather than go below again. The most fascinating fact: sharks followed the ships for so long that eventually the route became part of their DNA and their relatives still follow this route even though the slave ships ended hundreds of years ago. We all know about the Armistad Mutiny from the movie, but apparently their were more than 300 such mutinies. Quiet, we leave the museum. I leave feeling something deep within me has shifted. I understand on a different level, and I am not the only one. The next simulation gets us moving; we line up in pairs to walk across the Edmund Pettus Bridge. For me this was the beginning and the end. Bloody Sunday, the event that made me choose to register voters – my beginning in the Civil Rights Movement. And, for this day, it was the end of our tour. We have lots of time to think about the day on our three and a half hour ride to Jackson University Campbell Suites in Jackson, Mississippi. (When I was in college, they were called dorms. They don’t look like my dorm looked. They are pods, four bedrooms, one bath for two bedrooms, a living area and a kitchen!) We don’t arrive until 11:30 PM – got to be up and ready to go by 7:00 AM. Dropped off in front of the men’s dorm, the woman had to carry all their “stuff” to the women’s dorm.